PAUL JAY, SENIOR EDITOR, TRNN: Welcome to The Real News Network. I’m Paul Jay in Washington. And a few weeks ago in Washington, the International Monetary Fund and the World Bank held their annual meeting. This was a year after meetings where IMF, World Bank declared they would be new institutions, and the record of being the instruments (of course, they didn’t use this language) of neoliberal economics—things were going to change. Loans that were conditional, conditions that include privatization of publicly owned enterprises, pushing countries into growing cash crops to repay debt, less social spending, all this was going to change, we were told. The financial crisis was demanding a new response from these institutions and they were clearly looking for a new kind of relevancy. Now joining us to discuss whether there in fact is anything new about the IMF and the World Bank is Ilene Grabel. She’s a professor of international finance at the International Studies Department at the University of Denver, and she’s joining us from the PERI institute in Amherst, Massachusetts. She also blogs at TripleCrisis.com. So, Ilene, is there anything new about the IMF and the World Bank, or are we just hearing some nice words? ILENE GRABEL, PROF. INT’L FINANCE, UNIVERSITY OF DENVER: No, there are some things that are new about these two institutions. One thing that’s new about them is that they’ve become newly relevant. As you may know, after the East Asian financial crisis of 1997 and 1998, the IMF and World Bank became largely irrelevant institutions. Developing countries did everything they could to avoid future interactions with the bank and with the fund. And so, many of them began to turn away from them, such that the portfolio of the IMF and World Bank really became dominated by only those countries that had no alternatives to the bank. JAY: And if I understand correctly, the only real big borrower was Turkey for quite a while. But why did the other countries pull away from the IMF? GRABEL: Well, they pulled away because of the disaster of the East Asian financial crisis, where the IMF and World Bank completely mishandled those crises and forced countries that received assistance from the institutions to make really drastic cuts in social spending, to tighten monetary policy and fiscal policy, to open their economies to foreign capital. And it was a disaster economically, politically, and socially. And the intrusiveness of both of these institutions was also a real blow to the sovereignty of many borrowing countries, and that really caused many developing countries to reassess their relationships with the bank and the fund, such that they did all that they could to avoid any future involvement with those institutions, rendering them largely irrelevant to all but the poorest countries in the world. 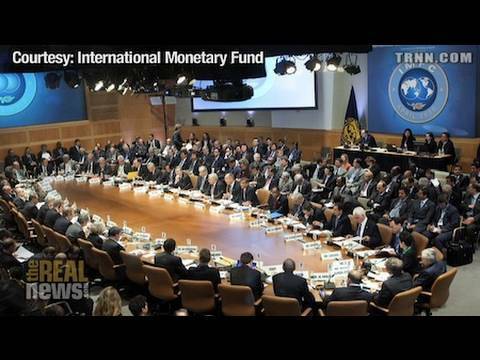 JAY: So about a year ago $750 billion gets pledged by the big economies to the IMF. Now there’s a lot of talk that in fact this will be stimulus money going to poorer countries and countries in crisis, and with all that language about the new IMF. But has that actually happened? The money—the countries that got some early money, if I understand correctly, were Colombia, Mexico, and Poland, countries that already had this kind of neoliberal economics, whereas a country like Latvia got into crisis, and they apparently hit them with more demands for cuts in social spending and such. So what’s new about all of this? GRABEL: Well, it’s certainly true that among the first sets of countries to receive support from the IMF as the crisis started to unfold were some of the countries that were considered to be the star performers. As you noted, under a new program called the flexible credit line, or FCL, Mexico, Poland, and Colombia received large kinds of standby credit facilities from the fund. It was also the case that some of the early countries to implode—like Iceland, many of the Baltic countries, countries in Central and Eastern Europe—received assistance, and indeed the lion’s share of the assistance funds from the IMF in the context of crisis have gone to European countries rather than countries that we would traditionally think of as developing countries in the global south. JAY: It sounds like it’s more or less IMF desperately trying to find a role for itself in the world. I mean, one of the big things that had changed before the crisis but still exists is some of these countries had alternatives for money. They could go to China and some other—even Iran, and get loans without the kind of conditions. So is IMF mostly just struggling to find its role? And in fact is it still the old neoliberal IMF? GRABEL: Well, I think the IMF has found a new role. The G-20 has given it a new role, and the new role is that it’s placed it at the center of efforts to respond to the global financial crisis. And the G-20 has given the IMF a lot of funding, and that—I think that that has revitalized the institution. Of course, it’s used to this new role to provide financial support, as I mentioned earlier, primarily to countries in Europe on the European periphery—Central and Eastern Europe, Baltic countries, and, of course, now we know Mediterranean countries are also poised for an infusion of capital from the fund. JAY: But all tied to the same thing. Like, Greece and—you know, we want massive cuts in your social spending; then you’ll get the money. But that’s the old IMF. GRABEL: Yes, that’s the old IMF. But what I would like to say, and I don’t want to overemphasize any sense in which the IMF is new, but I’d say that what’s different about the IMF is not its continued commitment to procyclical policies in the developing world. It is, of course, requiring many kinds of painful contractionary policies in exchange for these kinds of assistance programs. In some very, very modest respects it has loosened up some of the fiscal targets. It’s—of course, these fiscal targets are still highly contractionary, but the fund has demonstrated a very modest degree of flexibility when it comes to countries that face difficulties in meeting fiscal targets once they’re articulated. But I would emphasize that this is a very modest degree of fiscal flexibility. JAY: Alright. So let’s—just to make clear for our viewers, what IMF had been accused of (and I think the evidence pretty clear they were doing) is that in times of recession in the developed countries, they would promote stimulus, and those countries would print money or borrow money and stimulate their economies, but in the less developed part of the world they would actually promote cutbacks at the very time of recession and depression when these countries needed stimulus. GRABEL: That’s right. That’s right. JAY: So you’re saying there’s been a little bit of change on that. GRABEL: Right, there’s been a very, very modest change, I would emphasize. The IMF continues to have a commitment to what’s called procyclical policies, meaning forcing countries to cut social expenditures during a time of crisis. And so that continues to inform IMF relationships with borrowing countries. So there’s this very modest change, but I would emphasize it’s an extremely modest change. There are some other ways in which I’d say the fund appears to be wrestling with some of its core ideas that may be of more interest to your viewers, and some of those things are concerning policies that the IMF has traditionally been very, very committed to, and it seems to be wrestling with this commitment to—rethinking this commitment. And the two specific examples that I would give are capital controls, which are policies that control the international movements of capital to a country. The IMF has long been opposed to capital controls and has really punished countries for pursuing capital controls, and it appears that the IMF is now trying to wrestle with the issue of under what circumstances do capital controls have a role in developing countries. And that’s been something that I think has been very exciting. The IMF’s position on capital controls at this point has become more ambiguous than at any time in recent history. JAY: Okay. Well, in the next segment of our interview let’s talk about the IMF proposals and why all this matters to ordinary people in North America. Please join us for the rest of our interview with Ilene Grabel on The Real News Network.